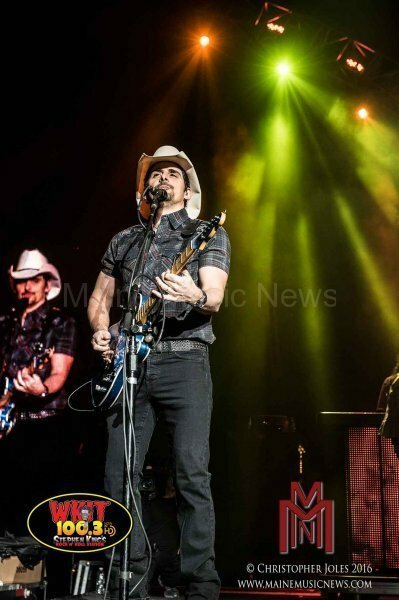 So far, it seems that Bangor, Maine’s Waterfront Concert line up will be heavy on country music for 2016, and Brad Paisley’s show, the first country show of the year, just set the bar nice and high, as fans knew he would. Stopping in at the Cross Insurance Center on January 29th on the winter leg of his Crushin’ It World Tour, Paisley and friends helped warm up the winter for, as he so aptly put it, “God’s Frozen People.” Another visual spectacle stuffed full of guitar and clever turn of a phrase, Paisley’s show was steeped in what we all want in our country music – talent. Grammy nominated Cam Ochs opened the show with her fun country sound that showcases her beautiful vocals and songwriting. Don’t be fooled, folks. Cam, traversing the stage in a miniskirt and glittery sneakers, could easily be overlooked as another fluff piece out of Nashville, but that does not seem to be the case at all. The opposite in fact looks to be true. Her material is well-written, witty, has a great beat, and is gimmick free. And her voice? Well, her vocals are tremendous with a substantial range, dripping in sweet tea, and could go toe to toe with the great ladies of country. 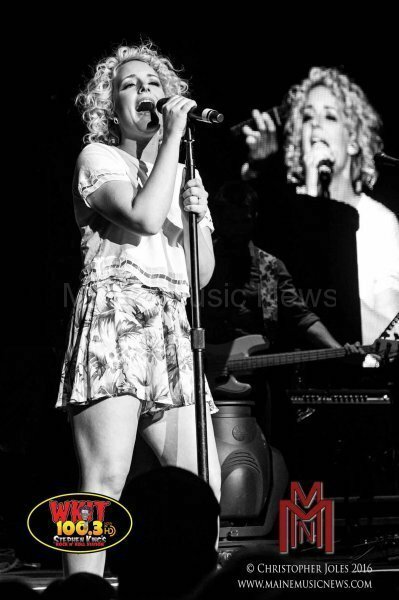 Although she is newer to country music radio, the fans were engaged with her performance and singing along. She shared her new single, “May Day,” as well as her recent hit, “Burning House.” Cam put on a great six song performance. 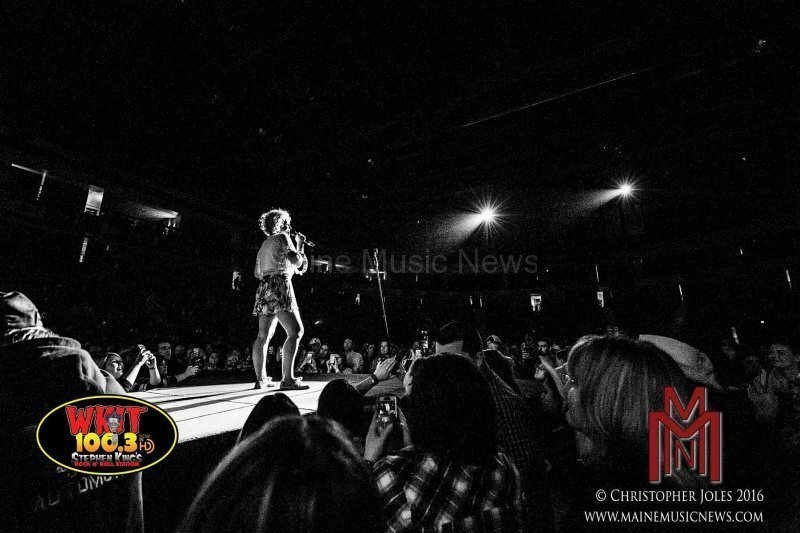 She will be back in Bangor with Dierks Bentley on the Waterfront Pavilion stage June 4th, so if you missed her, you have another chance in 2016. Don’t miss out. 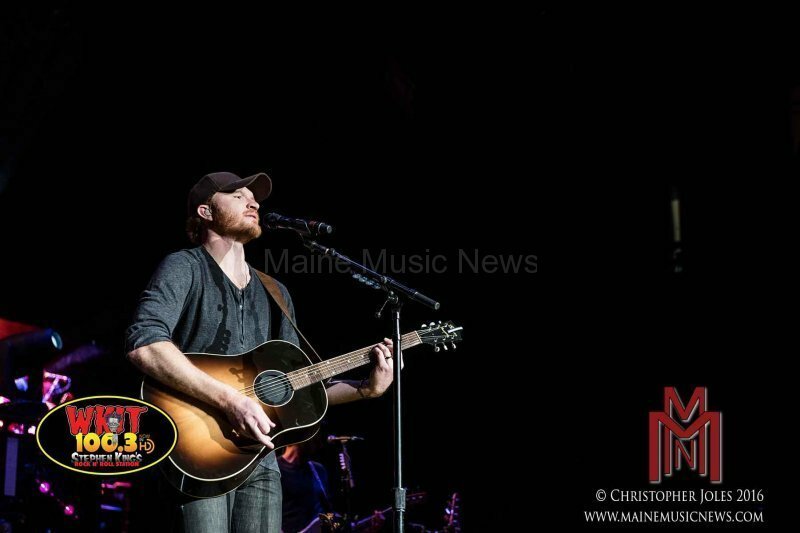 Another singer with exceptional talent for songwriting, Eric Paslay was up next. 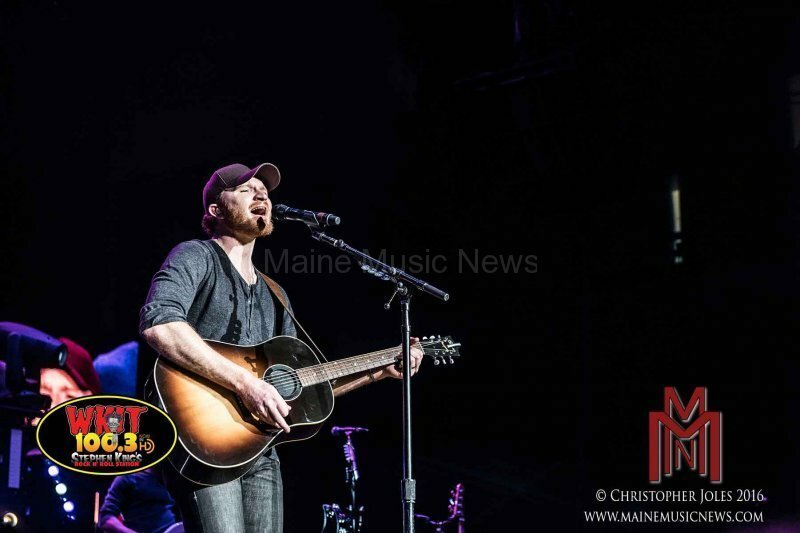 As Paslay noted for the crowd, he performed in Bangor while on the Country Throwdown lineup in 2012, gracing a side stage where his performance stood out from, and well above, the other artists. Now, with a critically acclaimed debut album to his credit and a soon-to-be-released follow-up, Paslay is proving that he belongs on the big stage. 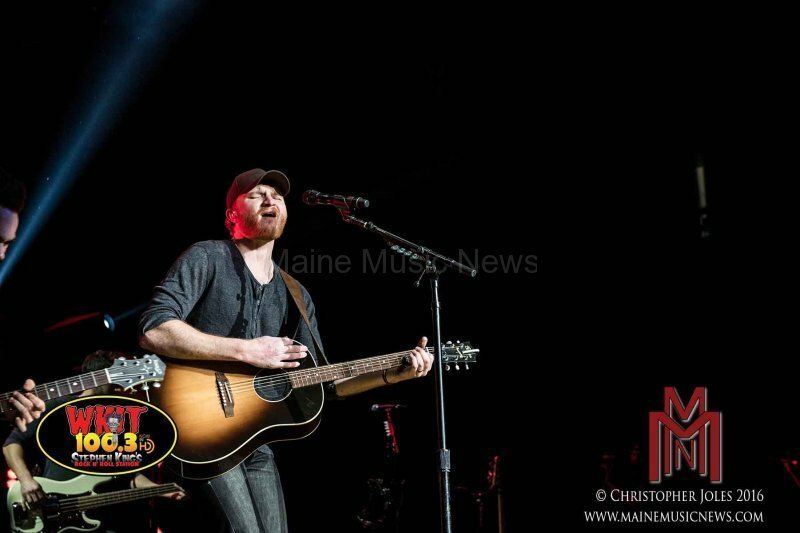 Paslay has yet to build a deep catalog of songs, but he gave the crowd an entertaining eleven song set that included some of his songs popularized by others: “Barefoot Blue Jean Night” and “Even if it Breaks your Heart.” It will be great to see where his career takes him next time he comes to Bangor. 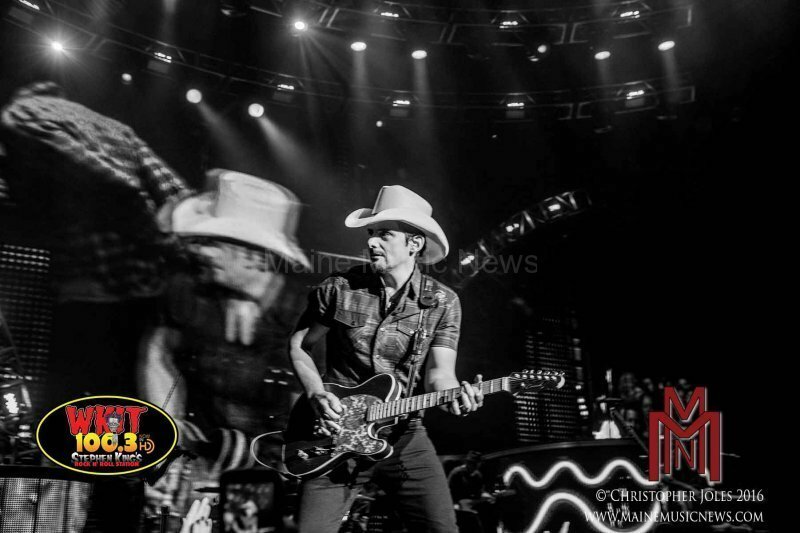 Brad Paisley performed in 2014 at the Waterfront Pavilion during his Country Nation tour, and the Crushin’ It World tour featured some of the same elements: hit songs, substantial stage video screens complete with customized content, i.e. Tom Brady and the Patriots, a ton of remarkable guitar playing, a lot of fiddle, and just plain fun. All of this action on the stage gave concert goers a workout just keeping up with the show, but that is what we’ve come to expect from Paisley – Everything. He combines his music, his guitar, and his graciousness into one big evening of superb entertainment. 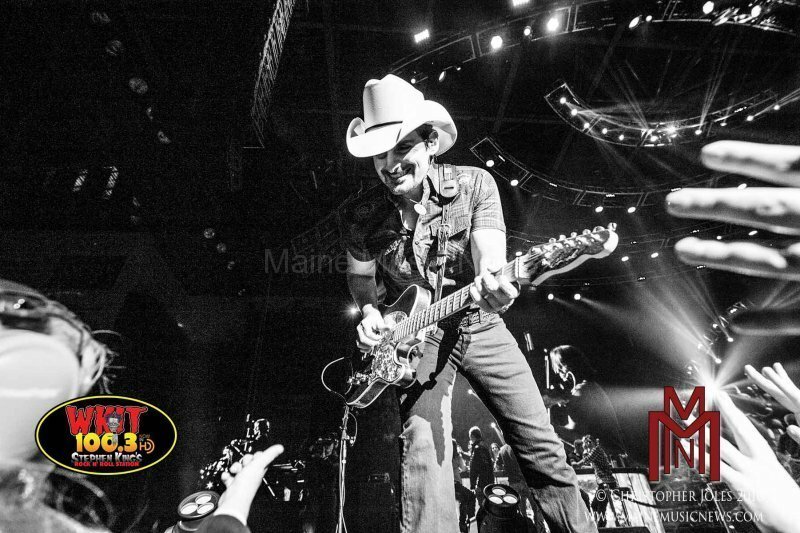 Folks, if you haven’t seen a Brad Paisley show, you are missing out on a great time. 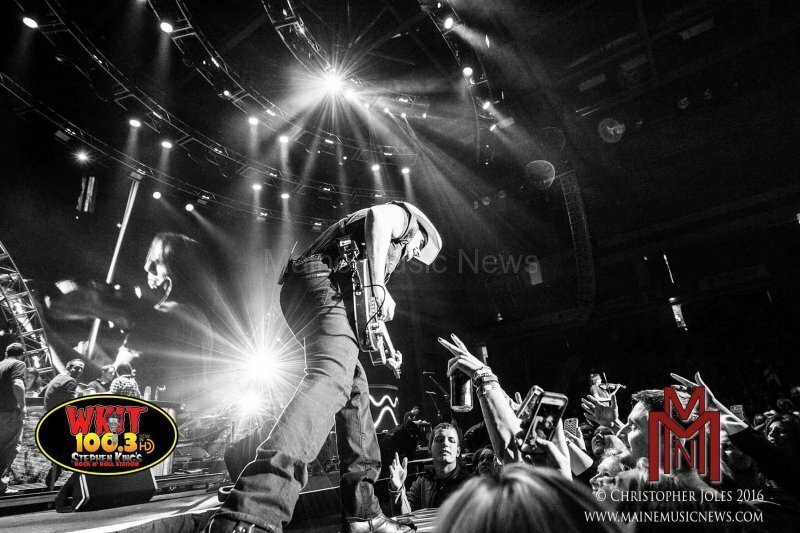 We can talk on and on about Paisley’s guitar playing, his great band, and his musical prowess, but that is only stating the obvious so let’s get to the highlights of the show. Starting off the twenty-four song set with “River Bank” and that adorable waterskiing squirrel, the race was on for Paisley as he coursed the stage and truss making sure the fans literally had hands on attention, autographs, plenty of picks, and cell phone moments. 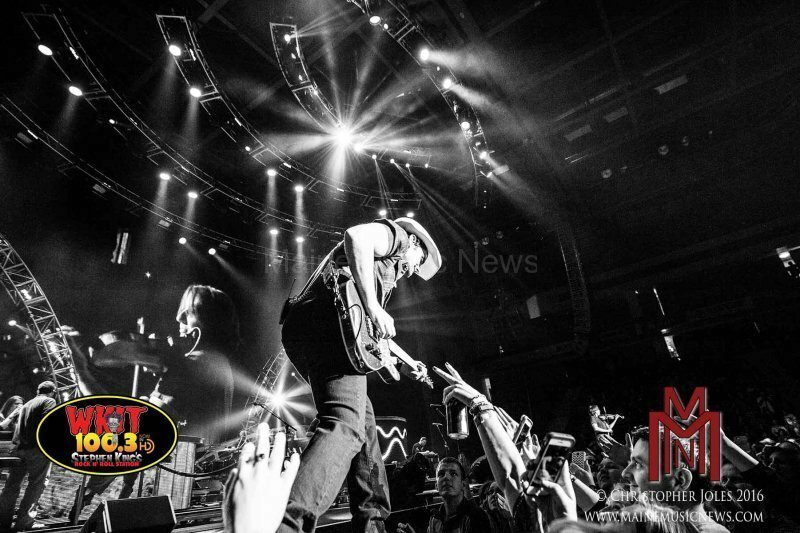 One lucky young fan’s entire world changed when Paisley handed him an autographed guitar and offered to teach him a chord after the show. As noted during his 2014 performance, Paisley’s interaction with the crowd is amazing and appears effortless. It is truly wonderful to watch. 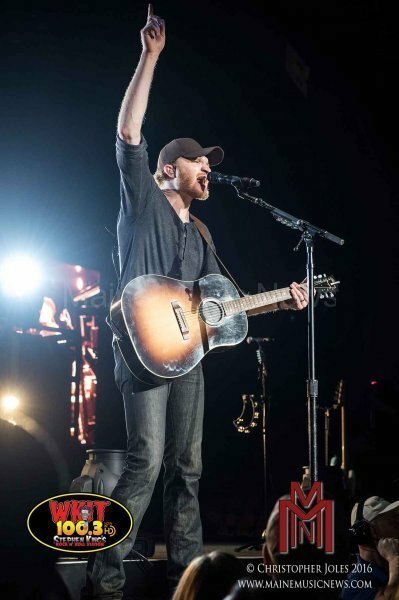 The show was nicely designed to move the audience through a string of Paisley’s faster-paced hits such as “Celebrity,” “Country Nation,” and “Southern Comfort Zone,” dotted with his slower songs like the charming “She’s Everything.” The latter being brief moments for everyone to catch their breath as the stage dims and the spot lights focus on just the man and his guitar. 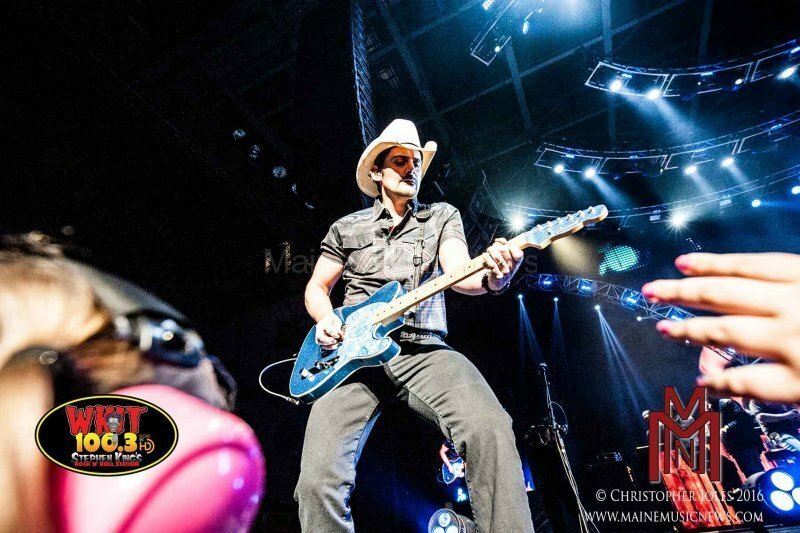 And the crowd needs this downtime – it isn’t every country show that features videos of blood sucking ticks, choice moments at the urinals, and muddy tires as well as the tight bluesy country guitar work that Paisley is famous for. Paisley was generous with his stage, and featured Cam on “Whiskey Lullaby,” a wonderful rendition, and Pasley helped out on “Celebrity.” Pasley also enjoyed an onstage Happy Birthday shout out from Paisley, as well as a pie in the face for turning another year older. In an effort to share the love with the entire venue, Paisley moved to a smaller stage (surrounded by a herd of security personnel, stopping repeatedly to sign autographs, and singing/playing all the way) at the back of the venue for a nice medley of sentimental, slower songs, including “He Didn’t Have to Be,” requested by a fan and not performed for several years. 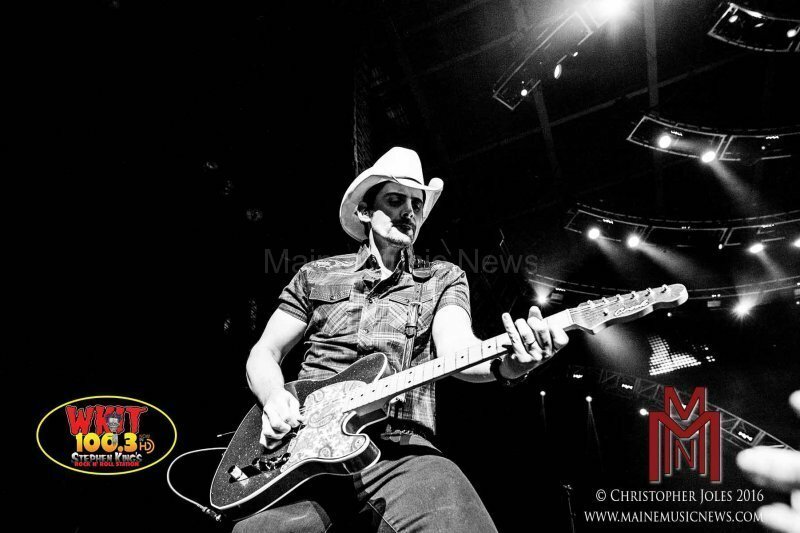 Thanks again, Brad Paisley, your second show in Bangor was as big and out of the park as your first. Come back soon.